Irma was born in Tanjung Karang on the island of Sulawesi and moved to Bali in her mid twenties. Tanjung Karang is a very beautiful but isolated place. Being the eldest of 7 children Irma was looking after her brothers and sisters from a very young age. As such she received no official schooling. Irma grew up without the comforts of electricity and running water, she was 22 years of age before she first turned on a tap in a shower. Despite these early disadvantages she now speaks three different languages, writes in three different languages, drives a car and operates the cooking school plus the hotel complex where the cooking school is located. 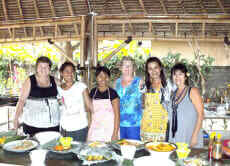 Along with her friend Dewi they started Bamboo Shoots Cooking School due to a common love of cooking and meeting people.